Hi all, George here again! So I have just hear from the Emily the emu that Santa is going to be visiting us again this year, ooooh it’s soo exciting! I usually don’t get this exciting, I like to play it cool really, but it is SANTA after all! It really is great news as the farm is currently being transformed into Ireland’s Lapland once again. 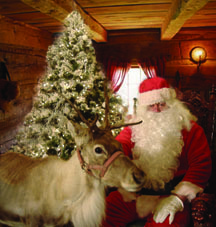 So it appears that Santa will be arriving on Sat the 3rd Dec at 5pm by horse drawn sleigh and he will be here visiting until the 23rd Dec, Mon to Fri from 4pm to 7pm and Sat and Sun from 2pm to 7pm. I really can’t wait to see him, I have my letter wrote and all so I will give it to him when he gets here, I have even asked for a surprise for Gina this year….see I am in a good mood. See you all here at Ireland’s Lapland soon!! !